The CAN-E report demands that a full coal phase-out should be one of the EU’s stated goals. This phase-out effort needs to be accompanied by dedicated support for mining regions affected by the transition from coal power and the development of clean energy with 100 per cent renewables. In March, Scotland witnessed the end to the coal age that fired its industrial revolution, with the closure of Longannet power station. In the UK nearly half of the coal fleet will close this year. In May, the EU authorised Spain and Germany to subsidise the closure of significant parts of their coal sectors. Spain was given the green light to spend €2 billion closing 26 coal mines by 2019 and Germany to subsidise the closure of eight lignite-burning installations between 2016 and 2019, representing 13 per cent of Germany’s lignite-burning capacity. In June 2016 the leaders of the G7 countries (UK, USA, Canada, France, Germany, Italy and Japan) and the EU pledged to eliminate “inefficient fossil fuel subsidies” (for coal, oil and gas) by 2025.And in June the Croatian government stopped building a new 400 MW coal power plant. Europe criticised the UN Economic Commission Europe (UNECE) for still promoting clean coal policies. Euracoal, which has 34 coal industry members in 20 EU countries, is jointly campaigning with the World Coal Association (WCA) for “a ‘clean coal’ strategy to fight climate change”, relying on what it calls “high-efficiency, low-emissions coal combustion technologies”. Coal is a climate killer whatever its efficiency is, argues WWF in a new report. The argument that high-efficiency coal-fired power plants are a viable solution for reducing CO2 emissions, the main cause of climate change, is completely discredited by research from Ecofys, among others. It shows that emissions from the global electricity sector need to rapidly reduce and reach close to zero globally by 2050 in order to stay well under 2°C. An even more rapid decline will be needed in order to achieve the commitment taken in Paris to “pursue efforts to limit the temperature increase to 1.5°C above pre-industrial levels”. As a result, it makes clear that in a post-Paris world, there is simply no role for coal anymore. Demand-side management and renewable energies are the solutions we need, says WWF. FOE Germany has proposed a legally binding phase-out plan for coal in Germany and in this issue of Acid News such a phase-out plan is proposed for the EU (page 12). The trend is clear. There is no more time for the EU to continue experiments with different environmental and economic measures to reduce emissions from fossil fuel plant emissions. The EU must now commit to a phase-out plan of all coal power plants, with complete closure before 2030 to avoid catastrophic climate change and to achieve many co-benefits, including the reduction of ill health and mortality for thousands of Europeans from air pollution. Every coal-fired power station switched off will bring great benefits that reach beyond national borders, for both human health and the climate. In 2013, air pollutant emissions from coal-fired power stations in the EU were responsible for over 22,900 premature deaths, tens of thousands of cases of ill-health from heart disease to bronchitis, and up to €62.3 billion in health costs. As air pollution travels far beyond national borders, a full coal phase-out in the EU would bring enormous benefits for all citizens across the continent, according to the report “Europe’s Dark Cloud: How coal-burning countries make their neighbours sick”. Each coal power plant closed will provide major health benefits, not only for those living nearby, but also for those abroad. For example, the planned UK phase-out of coal by 2025 could save up to 2,870 lives every year, of which more than 1,300 in continental Europe. A German phase-out of coal could avoid more than 1,860 premature deaths domestically and almost 2,500 abroad every year. The analysis of transboundary impacts shows that the five EU countries whose coal power plants do the most harm abroad are: Poland (causing 4,690 premature deaths abroad), Germany (2,490), Romania (1,660), Bulgaria (1,390) and the UK (1,350). It also shows that the countries most heavily impacted by coal pollution from neighbouring countries, in addition to that from their own plants are: Germany (3,630 premature deaths altogether), Italy (1,610), France (1,380), Greece (1,050) and Hungary (700). The study used data from 257 (of the total of 280) coal power stations that report SO2, NOx and particulate matter (PM) emissions to the European Pollutant Release and Transfer Register (EPRTR) and for which 2013 data was available. It is noticeable that the 30 most polluting coal power plants – the “Toxic 30” – alone were responsible for more than half of the premature deaths and health costs (see figure). “The report underlines the high costs to health that come with our reliance on coal power generation. It also debunks the myth that coal is a cheap energy source. Clearly, no country on its own can solve the problem of air pollution from energy production,” said Anne Stauffer, Deputy Director of Health and Environment Alliance (HEAL). Looking at greenhouse gases, the 280 coal plants released 755 million tonnes of CO2, which represents around 18 per cent of the total greenhouse gas emissions in the EU. Almost half of these CO2 emissions (367 million tonnes in 2014) came from the 30 highest-emitting plants – the “Dirty 30”. Three countries are home to 19 of the “Dirty 30” plants, namely Germany (eight), Poland (six) and the UK (five). The report recommends that a full coal phase-out should be one of the EU’s stated goals and that speeding up the process of transitioning out coal will require stiffening of specific EU policies, including a rapid and ambitious structural reform of the EU Emissions Trading System in order to put a meaningful price on carbon emissions. This should be accompanied by the introduction of an Emissions Performance Standard (EPS) for CO₂ from power plants to provide a clear investment signal for the decarbonisation of the power sector. In addition, the Industrial Emissions Directive (IED) and National Emissions Ceilings Directive (NECD) must introduce stricter pollution limits for the emissions they cover, and EU funding instruments need to be reformed so that they aid the transition away from coal and other fossil fuels and support regions and communities with mining region transformation. “The report shows that every coal-fired power station switched off will bring great benefits reaching beyond national borders, for both human health as well as climate” – Wendel Trio, Director of Climate Action Network Europe concluded. “After the Paris Climate Agreement, EU leaders have even more responsibility to dramatically ramp up efforts to shut down all coal power plants and swiftly move to 100 per cent renewable energy”. Figure. 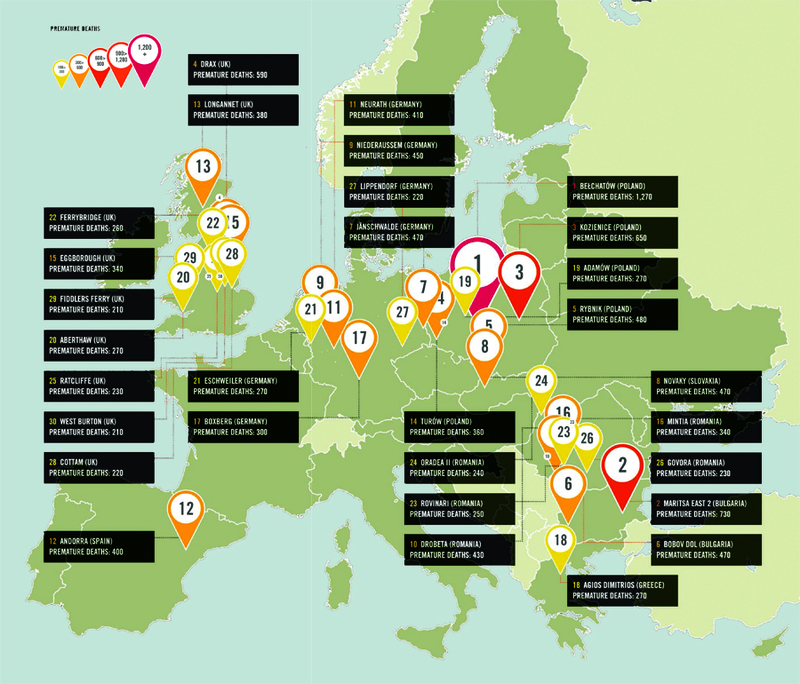 The “Toxic 30” – the EU coal power plants that do the greatest health damage. Very old and high-emitting plants are easy to replace with renewables and improvements in energy efficiency. The worst 30 coal and lignite power plants in Europe (EU-28) emitted 353 million tons of CO2 in 2015, more than 10 per cent of EU emissions. A phase-out plan for coal in Europe could start with a mandatory age limit of 35 years, along the lines earlier presented for Germany by the Society for Environment and Nature Conservation BUND/FOE Germany. Such an age limit would reduce CO2 emissions by almost 262 million tonnes per year just among the 30 worst. CO2 emissions in Europe are dropping, but no way near fast enough to comply with the Paris agreement. The 2020 target, 20 per cent less than 1990, is clearly inadequate, which shows in the low carbon price on the ETS market. In practice, the EU still follows the “walk now, run later” scheme. One of the lowest hanging fruits is the power sector, where very old and high-emitting plants are easy to replace with renewables and improvements in energy efficiency, which have no direct emissions at all. The worst lignite plants emit 1.35 kg of CO2/kWh, more than three times more than a gas power plant, which is also fossil-fuelled. One path to deal with the worst plants has been developed by BUND/FOE Germany, as reported earlier in Acid News 3/14. It is a ban on all plants older than 35 years, which means that plants that started operating in 1985 or before must be closed by 2020. In 2013, German coal power increased, despite fast-growing renewables. This created a crisis for the Energiewende. It looked as if nuclear power had been replaced with more coal, both lignite and hard coal. This was not really the case. Renewables grew fast, but so did power exports. And, unexpectedly, for both economical and political reasons gas power suddenly fell, while imported coal became dirt cheap. The sudden coal surge threatened Germany’s environmental targets and reputation. Something had to be done. BUND, the German Friends of the Earth, came up with a plan in 2014, aiming at phasing out the oldest and dirtiest coal and lignite power plants by 2020 and all such plants at age 35. If such a 35-year age limit phase-out were to be implemented all over Europe (EU-28), it would cut emissions by about 260 Mtons (from 353 Mtons in 2015) by 2020 or very soon thereafter, just among the worst 30 plants , known as the Dirty Thirty. About 140 Mtons of this reduction would come from lignite plants and the remainder from hard coal power plants. This is calculated by taking the 2015 emissions from each of the Dirty 30 plants, their capacity and the share of that capacity that will have reached 35 years by 2020, or in a few cases by 2021 or 2022. Some of these 260 Mtons will obviously be cut for other reasons. Longannet in the UK closed in 2015 and there are plans for other plants to either close some units or to use them less, by downgrading them from baseload to peak or reserve operation. This can make a big difference; a baseload power plant is supposed to be operated for about 90 per cent of the year at full capacity, or 8,000 hours, but a peak/reserve plant may operate in the order of 100 hours per year, decreasing emissions proportionally. Some plants may also switch from coal to biomass. Drax in the UK used more biomass than coal in the first six months of 2016. It is difficult to tell whether enough biomass will be available at justifiable cost five years from now and what the political conditions will be. The age structure of the plants – at least among the Dirty 30 – is such that many plants are old, a few new, but not so many in between. A 35-year limit is not a panacea, as a number of big coal power plants have been commissioned very recently, and unwisely from every perspective. Under a serious climate policy, they cannot be allowed to operate anywhere near the lifetime expected by the investors. Big change does not, however, necessarily mean a long time scale. Japan had 54 nuclear power reactors that supplied 30 per cent of the nation’s electricity in 2010. Since the Fukushima disaster in 2011 almost all nuclear power has been shut down, with just 0-3 reactors operating between 2013 and now. This happened without any previous planning and, except for the first two summers, without any rationing or other exceptional measures. The demise of all coal mining and much coal power in the UK has also happened very fast. The problem is not whether dirty coal can be phased out, using existing technology and without requiring big economic and administrative burdens. It can. The problem is whether it can win political acceptance by being done in an equitable way, without undue burdens on certain groups and regions. The German Green Party has developed a Road Map for Coal Exit in Germany , a 10-point plan, which gives a picture of how stumbling blocks can be overcome. Start a dialogue about the coal exit (until the end of 2017). Resolve the coal exit (by June 2018). Establish an oversight commission (April to December 2018). Prohibit new open-cast mines (by June 2018). Introduce CO2 budgets for fossil fuel plants (by June 2018). Enforce environmental and health protection (by October 2018). Protect funding of subsequent cost (by December 2018). Shape the structural change (by December 2018). Get emission trading (EU) into motion (by June 2019). Economic and social safeguarding (starting June 2019). The devil is indeed in the details, but so are his opponents. The Paris Agreement constitutes a global turning point away from fossil fuels and toward 100% renewable energy. For the first time in history all countries have agreed to take drastic action to protect the planet from climate change, to jointly pursue efforts to limit temperature rise to 1.5°C and eventually reduce emissions to zero. Following this historic outcome, the next step is to translate these Paris commitments into deep emission reductions in all countries. There is no doubt that implementing the Paris Agreement will require a complete overhaul of the EU’s current climate and energy policies. Since the Paris Summit we have already witnessed the transition to a 100% renewable energy economy speeding up. It is in the EU’s own interest to be a frontrunner in the race towards the zero-emission economy. Increasing action before 2020 is a prerequisite to achieving the long-term goals of the Paris Agreement. Cumulative emissions determine the level of global warming, so in order to be consistent with the long-term goal of 1.5°C adopted in Paris, it is paramount to consider the cumulative emissions budget – the total amount of carbon dioxide emitted into the atmosphere. The IPCC’s 5th Assessment Report provides numbers for different global carbon budgets allowing for different levels of warming. With current emissions of 38Gt of CO2 per year, the entire carbon budget that would allow a 66 per cent chance of staying below 1.5°C would be completely exhausted in five years. A budget allowing only a 50 per cent chance would be gone in nine years (figure 1). Figure 1. How many years of current emissions would use up the IPCC’s carbon budgets for different levels of warming? Source: Carbon countdown graph by Carbon Brief Data IPCC AR5 Synthesis Report table 2.2. For any fair likelihood of keeping temperature rise to 1.5°C, global mitigation efforts need to be stepped up between now and 2020, and extended to all sectors, including international shipping and aviation. Increasing mitigation action before 2020 is vital for achieving the long-term goals of the Paris Agreement, and will be one of the key issues if the UN climate conference COP22 in Marrakech in November 2016 is to succeed. Keeping in mind that the EU has already achieved its -20% by 2020 target several years in advance, and is progressing towards 30 per cent domestic reductions by 2020, the EU can make a significant contribution to this discussion by, among other things, cancelling the surplus of pollution permits under the Emissions Trading Scheme and the Effort Sharing Decision. We urge the EU to seek solutions that can help drive global emissions to a deep decline as of 2017, both in the context of the Global Climate Action Agenda as well as strengthening the national pre-2020 commitments on mitigation and finance. 2025 and 2030 targets must be revised in 2018 at COP24. The post-2020 commitments (INDCs) put forward by countries are inadequate for keeping warming to 1.5°C (or even 2°C). Last May the UNFCCC Secretariat published a report assessing the aggregate effect of countries’ post-2020 targets. 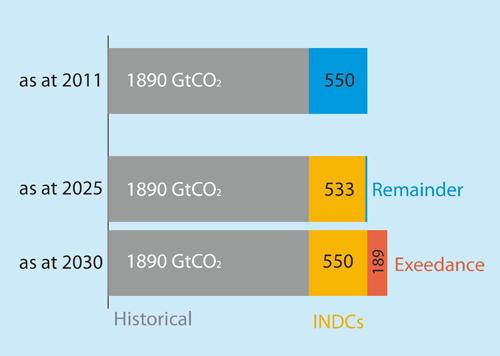 The report’s graph below concludes that while most of the carbon budget was already consumed by 2011, countries’ unrevised INDCs will entirely consume the remaining 50 per cent chance of achieving a 1.5°C compliant carbon budget by 2025. All COP22 countries need to commit to prepare their respective assessments on how to raise the level of post-2020 targets to bridge the adequacy gap by COP24 in 2018. To facilitate this process we urge countries to put forward updated and improved post-2020 INDCs as soon as possible and latest by 2018, and to finalise their long-term strategies as soon as possible, and latest by 2018 (figure 2). Figure 2. Cumulative CO2 emissions consistent with the goal of keeping global average temperature rise below 1.5°C, with >50% probability by 2100. INDCs = intended nationally determined contributions. 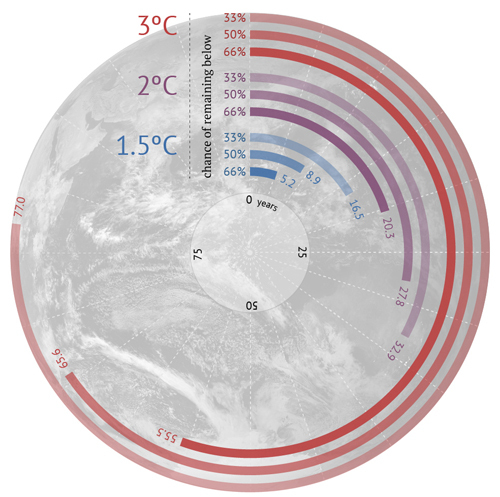 Source: IPCC Fifth Assessment Report scenario database and own aggregation. The EU’s ongoing legislative work on ETS and non-ETS emissions should be used to align the EU’s 2030 targets with science and the commitments made in Paris, and make them economy-wide, covering EU-related emissions from international aviation and shipping. International shipping and aviation currently account for around 5 per cent of global CO2 emissions, and these emissions are anticipated to have vast growth rates (50–250% by 2050 for shipping, and 270% for aviation). As these sectors’ emissions are not counted under national inventories, the 2018 stocktake must ensure that these sectors too are in line with the Paris Agreement and the 1.5°C compatible carbon budget. Long-term strategies for zero greenhouse gas and 100 per cent renewable energy. The Paris Agreement includes a long-term goal to pursue efforts to limit temperature increase to 1.5°C requires a reassessment of the EU’s climate and energy policies, and an increase in action by all. The goal to reduce the EU’s domestic emissions by 80 per cent by 2050 is not consistent with the Paris Agreement and has to change to be consistent with the long-term goals governments decided in Paris. The Paris Agreement also contains a commitment to reduce net global emissions to zero during the second half of the century. Achieving this requires most sectors in the EU to achieve zero emissions earlier, within the next couple of decades. Most urgently, the EU should adopt timelines for fully phasing out the use of coal, gas and oil. In order to facilitate the process of aligning all policies with the long-term targets of the Paris Agreement, all countries should swiftly proceed in the development of their respective 1.5°C compliant mid-century strategy. Having a long-term strategic vision will help to guide their short- and medium-term decisions and will have a positive impact on a long-term framework for innovation and business development. The updated EU 2050 roadmap should be finalised latest by 2018, and take fully into account the recent striking developments in renewable energy. A COP decision in Marrakech setting the deadline of finalised mid-century roadmaps by 2018 would ensure that all countries begin preparations swiftly. Shifting of financial flows. The Paris Agreement also includes a requirement for making all financial flows consistent with low greenhouse gas emissions and climate resilient development. In the first instance this requires the EU to tackle those financial flows that are obstructing emission reductions, and which hinder progress towards the EU’s broader economic and social objectives. They include fossil fuel subsidies, public finance for high-carbon infrastructure through European development banks, and policy frameworks that facilitate financial support of fossil fuels. The climate finance roadmap to raise 100 billion US dollars by 2020 should be launched in advance of Marrakech COP22. The roadmap must not be an accounting exercise for already existing financial flows, but rather guarantee stronger transparency, as well as adequate and reliable support for tackling the causes and impacts of climate change. It should also explicitly spell out to what level the EU and other donor countries will increase annual adaptation finance by 2020. The current review of the EU ETS provides a key opportunity to showcase the EU leadership on climate finance, committing to direct a portion of the revenues from auctioning directly to the Green Climate Fund. Setting up an EU ETS International Climate Action Reserve would give a clear signal to developing countries that the EU is committed to continue to provide additional finance for climate needs in predictable and transparent ways. The Financial Transaction Tax should be implemented as soon as possible. Resilience, adaptation and loss and damage. Even with the existing and future measures to mitigate climate change, the adaptation needs of all countries will continue to grow, undermining the rights of the poorest and most vulnerable communities in particular. The EU should lead efforts to strengthen human rights in all climate action, as mandated in the Paris Agreement. Ratification of the Paris Agreement and its early entry into force. A rapid entry into force of the Paris Agreement would demonstrate that there is a strong international support for ambitious climate action and would serve as a strong signal to the private sector. All COP22 countries should set 2018 as a deadline for full entry into force of the Paris Agreement, including finalising all the outstanding work on rules and modalities for countries to be able to implement the Agreement. What is behind the diesel cars emissions scandal? The air pollution scandal that hit front pages around the world last year with VW’s admission it had been cheating emissions tests has got much bigger. A UK government-sponsored trial launched in the wake of the VW revelations has found that every single one of the diesel-fuelled vehicles tested had higher emissions of nitrogen oxide pollutants than permitted under EU laws. For some models emissions were 12 times the legal limit. None of the 56 vehicles tested in Germany and 37 in the UK was found to have a defeat device aimed at artificially lowering its emissions under test conditions, such as those used by VW. But all were found to exceed the EU-set standards on air quality and pollution when driven in real-world situations. Clearly there are important questions for manufacturers. So what is happening? Crucially, the higher emissions were found to be the result of engine management systems that are routinely used by manufacturers to improve the performance of their vehicles. One by-product is more polluting emissions. Environmentalists say the result is not unexpected. “This confirms what experts have been saying for years: deadly emissions are far higher in the real world than in controlled tests in the lab,” said Oliver Hayes of Friends of the Earth. This points to the inadequacy of current testing regimes, but it also reveals a much more alarming truth: that manufacturers are tuning their vehicles’ engines in a way that hurts all of us. Engine management systems have become standard across the industry, and these new tests make it clear that they are there for one purpose: to improve the performance of the car, even if that comes at the expense of those breathing in the air from their exhausts. Diesel engines produce much higher levels of air pollutants than petrol-driven engines, although they produce less carbon dioxide. This has led EU member states to encourage drivers into diesel cars, reducing the impact of driving on climate change but vastly increasing the problem of air pollution. The UK is one of the few EU countries that tax diesel at the same rate as petrol, as most countries skew their taxation levels to favour diesel (although tax parity still favours diesels because they do more miles per gallon). It is ironic that the push for lower carbon dioxide emissions to combat climate change has led to higher air pollution. And the European commission has been slow to get to grips with the problem. A major announcement on air pollution in late 2013 failed to even mention diesel cars. But the problem is now pressing, as new research is revealing the extent of the damage being done routinely to our health, particularly the majority of the world’s population who live in cities. About 7% of deaths are caused or contributed to by air pollution, according to the World Health Organisation, and the effects on people’s quality of life is even greater. Long a silent killer, air pollution is now being recognised for its devastating effects, particularly on small children and older people. The question those breathing the pollution will be asking is whether governments are prepared to act.